The latest DCEU film to release on Blu-ray is finally here. Aquaman was such an enjoyable theatrical experience that I knew coming out of the theater the 4K UHD would be mine. Deciding on a retailer exclusive was not too stressful as I think the artwork and design of Target’s digibook packaging is very good for titles I really enjoy. The retailer doesn’t dab too much into alternative artwork to make Blu-ray covers pop, and that’s good because Aquaman’s characters are so vibrant as it is in existing promo stills. There is over an hour of special features included aside from the feature film. Highlighting the features are pieces on Jason Momoa becoming Aquaman, plus another focusing just on Black Manta. The upcoming Shazam movie has a sneak peak feature as well. The greatest feature of the digibook is the lenticular cover of Aquaman and Black Manta. I personally like the Black Manta portion with his power pose seen prominently in the movie. 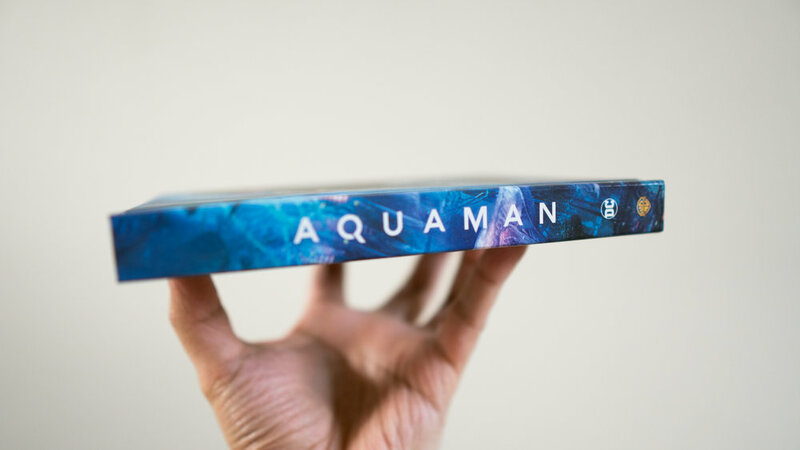 Selections of the Art and Making of Aquaman makes up the book content inside the packaging. It’s quite informative on the subjects it does touch on (characters and story locations). A fun feature for the discs is including IMAX scenes in their original aspect ratios. I love watching films utilizing IMAX and the shifting size. Some people don’t even notice this technical bit unless told about it, but when those black bars disappear on a display.. pure love. One thing I am hesitant about digibooks is there structural integrity over time, but this goes across the board regardless of what store sells this type of packaging. I think this will be very dormant on the shelf since my disc-playing days have become scarce, but I still find joy in owning a film in physical media format.